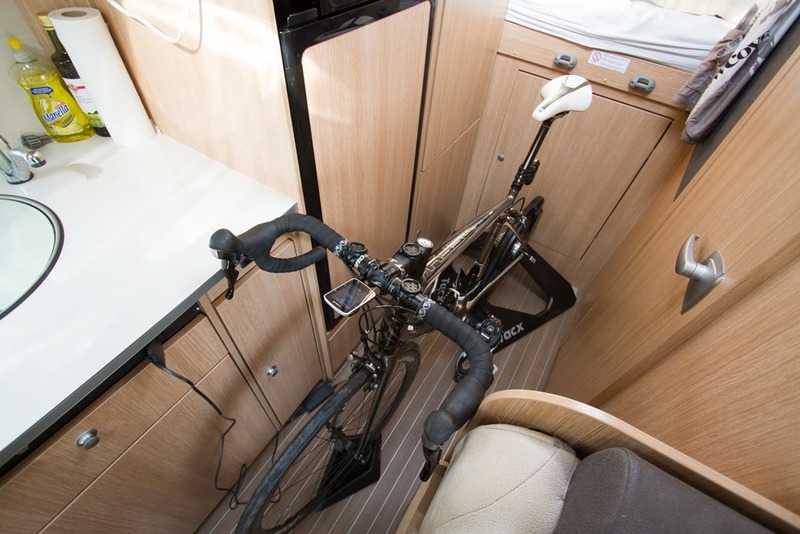 A Tour of the DCR Eurobike RV! 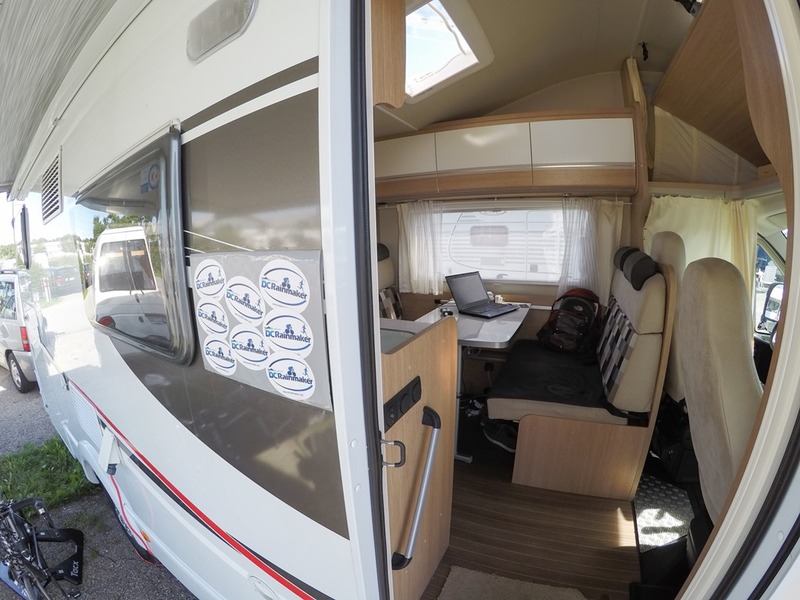 Ok, you’ve got nearly a dozen Eurobike tech posts out the door (and two last stragglers on the way), but it’s time for something a bit more fun: A tour of my Eurobike RV! 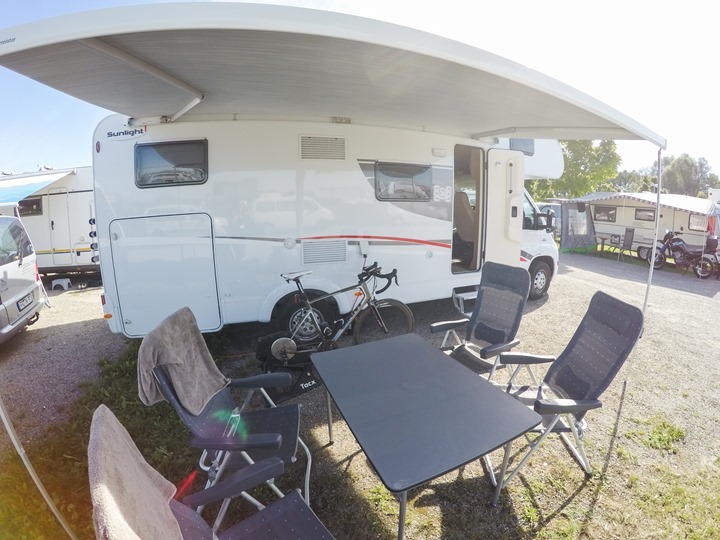 While the 6.98 meter long camper is long gone from the Eurobike RV lot, I figured I’d show you where I was staying during that week, and all the gadgets and gizmos I brought with me. To be clear, I don’t own the thing – but rather just rented it for the week (all the details later on). See – quick and easy, right? Wait, you want a photo tour too? Sure, no problem, here’s a few shots within the RV. Starting of course with the outside. I managed to snag a prime parking spot right on the end near a tree. The only slight downside here was that they ended up routing some of the parking lot traffic through at the end of the day, but usually I was out and about then anyway. At the back of the unit is a pretty large storage closet. I could have easily fit 3 bikes in there, perhaps 4 squeezed in. Plus there’s the table/chairs storage and some other random stuff (power cords, water attachment piping, etc…). 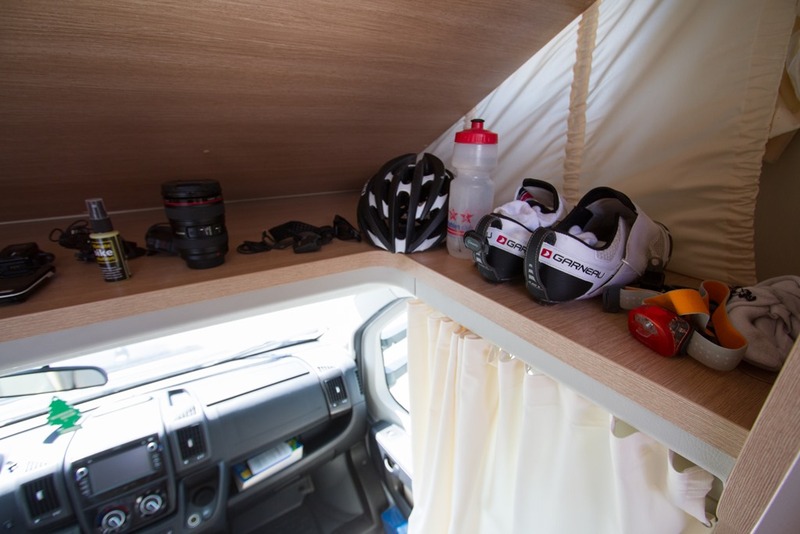 The RV came with the tables and chairs you see, which make great towel drying racks. Additionally, it also included the overhang piece, which simply rolls out using a little tool. After heading on inside by going up the automagically extending steps, we have arrived. I only had some DCR stickers to make a sign for the door, combined with a 50-cent paper protector from the grocery store. Next year I’ll step it up and order a larger DCR magnet car sticker from Vistaprint or something. Inside if we turn to the right we’ve got the driving portion. Two seats, but also has a little fabric divider I can close at night if I wanted to (Note: Would not recommend closing while driving, might lead to flying RV if in the mountains). Facing towards the back we’ve got a table with two couches seating four people. Or, one me. This is where I spent the majority of my non-sleeping time in the RV, working on posts for Eurobike. 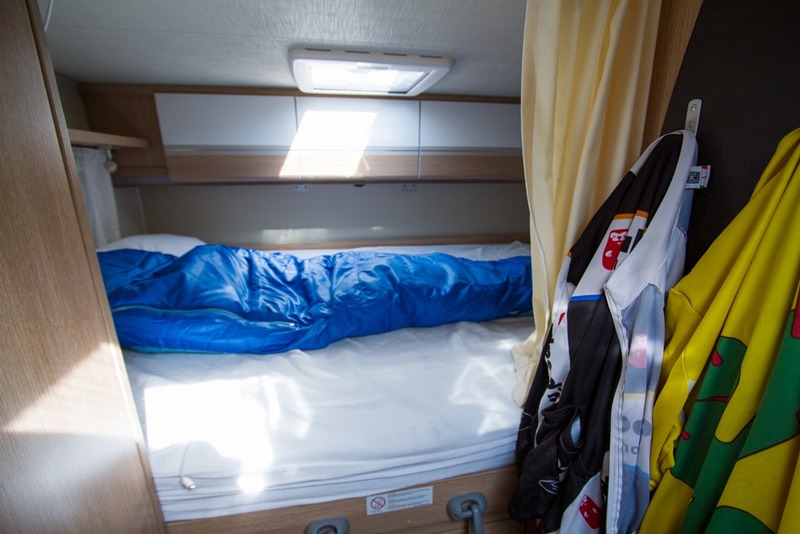 This actually folds into a bed as well, though that would probably be a bit tough in terms of logistics (i.e. no place to eat then). Above you see the kitchen to the side. I cooked pretty much every meal I had at Eurobike here. Super easy. 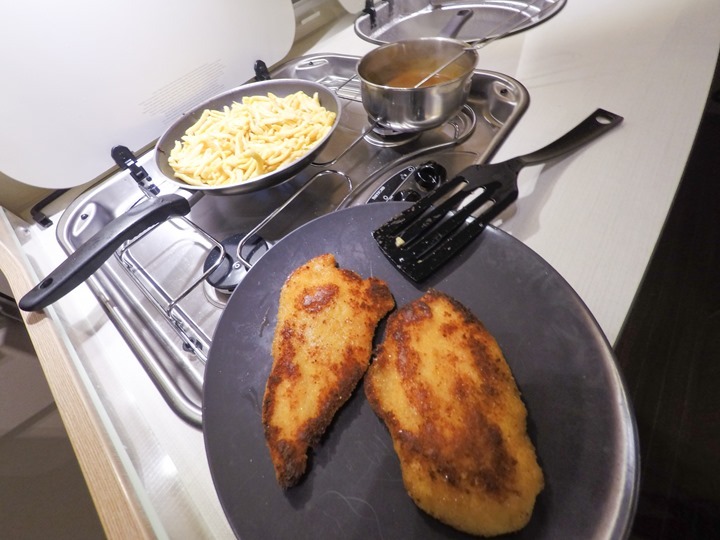 Most of the time my meals were usually pasta or just quickly pan frying up some sort of meat. I didn’t have a lot of time to get all French Laundry in this kitchen. And most of the time I was simply working away while I ate. 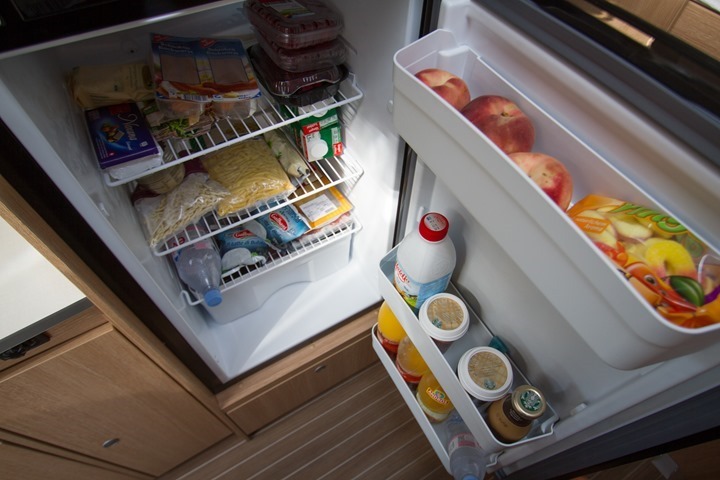 The fridge is pretty good sized. 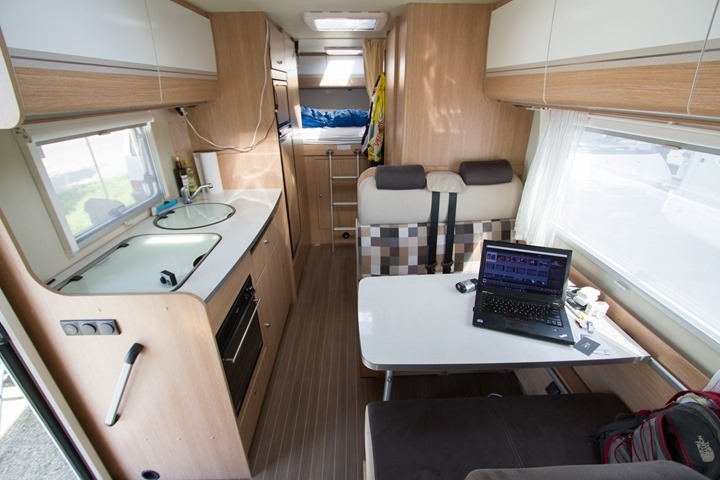 It keeps cold using the electrical power that’s supplied by the camp, though it can also run off of gas while parked (and while driving, using the motor to battery). Obviously I have a strong selection of peach based products on the upper shelf, and caffeine down below. I like juice and fruits a fair bit, as you can see the stack of raspberries there too. The ice cream is totally not entirely my fault. I had visitors one night and there was leftover ice cream. Thus I can only be blamed for half of this. Above all that I fashioned a USB charging station. It can do 5 plugs at a time, using an 8AMP total USB charger (so high capacity). Love that thing for travel (versus what I use in the DCR Cave/Studio), as it’s also dual voltage. Further, it supports Frosted Flake storage. Going further back we’ve got a bathroom. 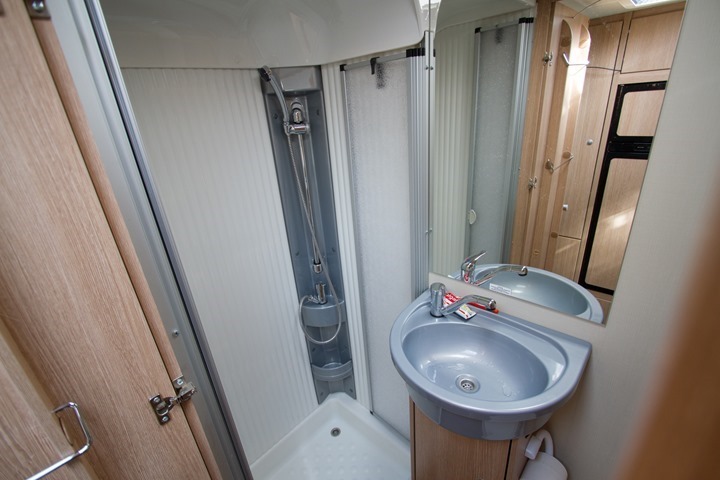 It includes a shower, toilet and sink. Pretty straightforward. I used it a fair bit while not in the RV park, but in the RV park I just showered at the building, since it minimized my RV water usage. Finally we’ve got the rear bed. It’s pretty big – roughly queen size I believe. The rental didn’t come with a full sheet set, so I just tossed a sleeping bag on it. Super easy that way. Above it is tons of cabinet storage and shelves too. All of the roof-top windows also have shades and screens, so you can close them up as you see fit. The base only fit in that rear area, and not up front. Also note that you can see the door entrance behind the seat post into the massive storage space that I mentioned from the exterior shots. With that, I’ve shown you basically everything I’ve got within the RV! 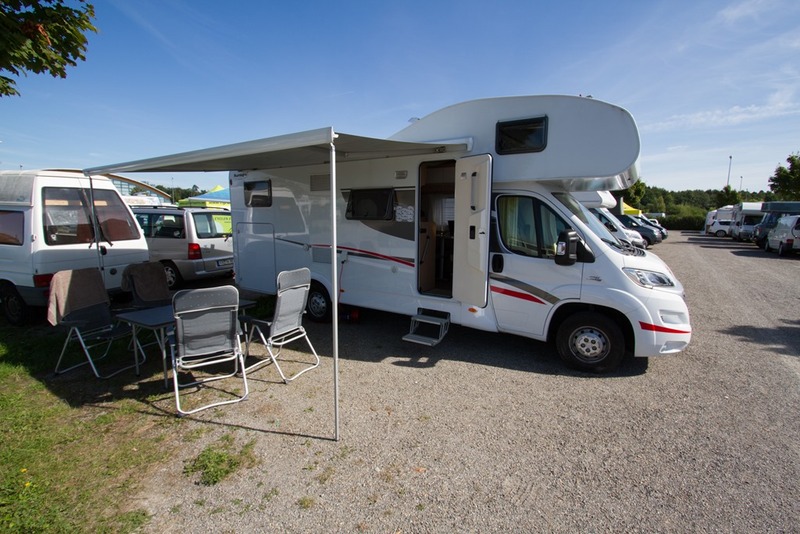 Did you rent the RV, and if so – where? Yes, I rented it from a place in Zurich. They’re just a couple of kilometers from the airport (5 minute drive). I booked it online just a few weeks ago, super easy. From there it’s a little bit under a 2hr drive from Zurich to the Eurobike show grounds. Where did you park it? There’s a dedicated RV parking lot (well, more like three of them) on the grounds of the Eurobike convention center. Essentially they’ve turned one of the parking lots into an RV lot. It costs $20 per night to park there. This includes electric for you to plug the RV into. 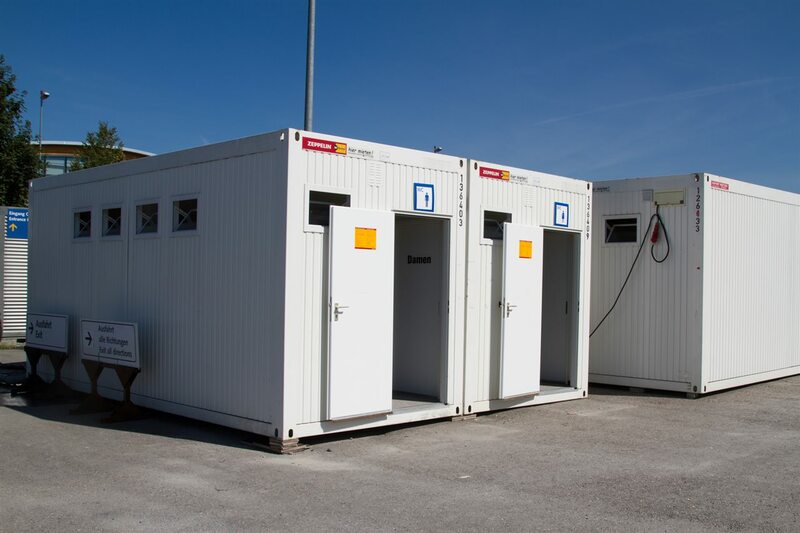 Additionally, the parking lot includes large shower stalls (usually hot/warm if you time it right), bathrooms, a dish cleaning area, and a water fill/dump station. 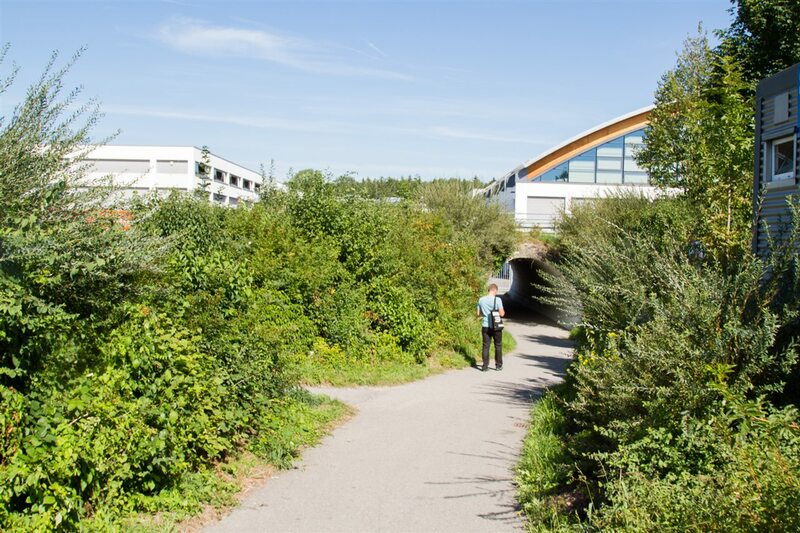 Oh, and it’s all of a 3-minute walk to the front door of Eurobike. Was there electricity & water? 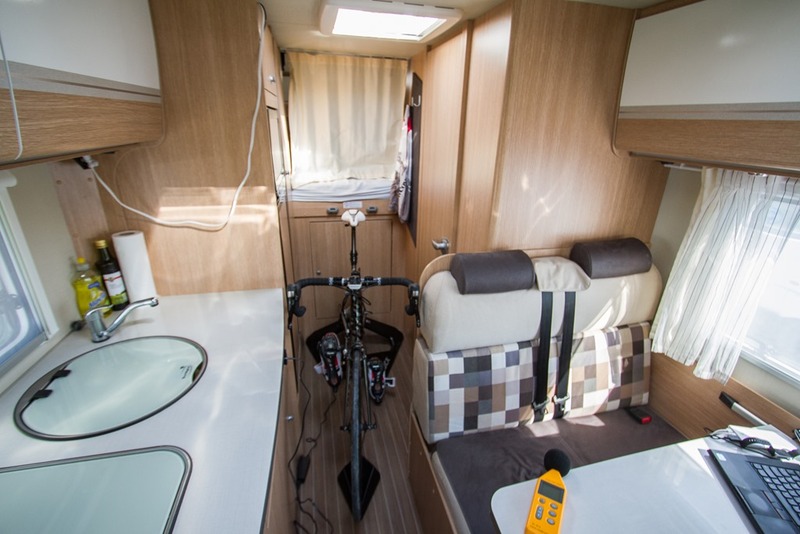 Yes, at the Eurobike lots they did have plugs for RV’s (included). 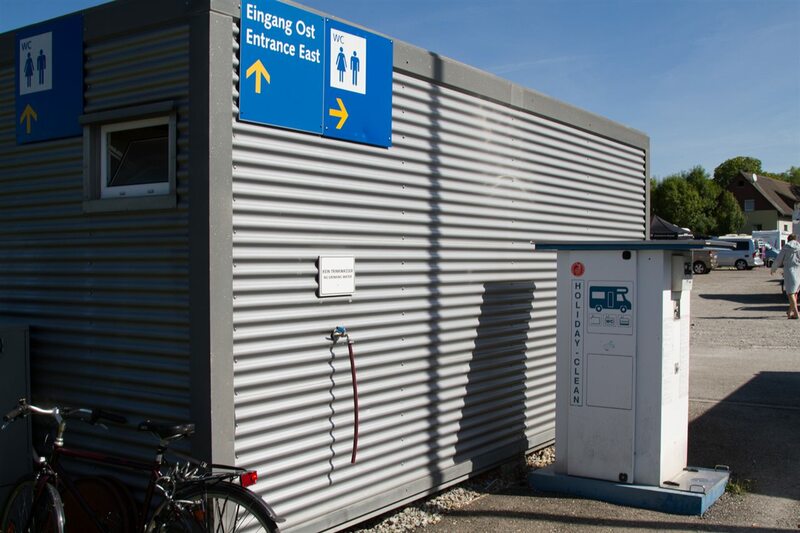 They also had a location to fill your water tanks near the entrance, so you can drive over there to fill-up at the start of the week. Further, they had a central dump tank station as well for toilet goodness. Right behind it, a small walkway/tunnel connects you to the main convention center that you can see in the background. How much did the RV rental cost? It’s pretty cheap – cheaper than a hotel would be in this area during this week. For Monday to Friday it would have been 640EUR (total). We added a few extra days on the weekend as well of course, so that ups the price a bit. But for just the Monday-Friday piece it’s rather inexpensive. That includes a full kitchen set and the tables/chairs outside and the overhang (depending on the model). It does NOT though include bedding, hence why I have a sleeping bag. You can rent that from them. Same goes for towels, but there’s a gigantic grocery/department store across the street from the RV rental place in Zurich – so I just bought cheap towels there. There’s 2-3 large grocery stores within about a 5-7 minute bike distance, right beyond the grounds of the convention center. The RV lot and the convention center also have free bike rentals through the town, like a bike share program. I didn’t use it, but just an FYI that it’s there. At worst though it’d be a 15 min walk to the nearest grocery store (which is massive). From there I could cook anything I’d like. Since I was plugged in the entire time, the fridge stayed cold (and the freezer stayed frozen). 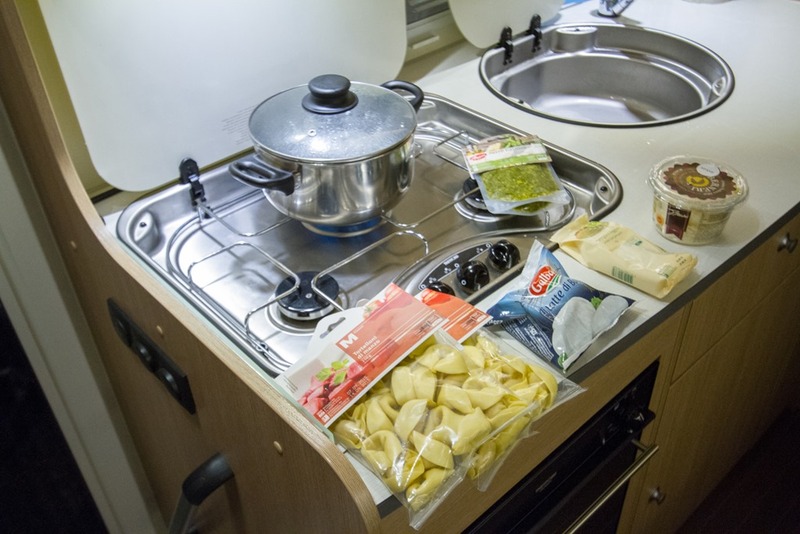 The RV came with two gas tanks for use with the cooking stove inside. Fairly easy really. Just like a big SUV, except taller. It was 6.98m long, or basically 23ft. And it was 3.2m tall (about 10.5ft). And yup, I’m definitely doing it again next year! And there is no rolling pin in any picture so how are we to know the size of the RV? Holy moly these just made me spit out my coffee, hilarious. All nice and all that but where’s the Power Meter reviews?!?!? 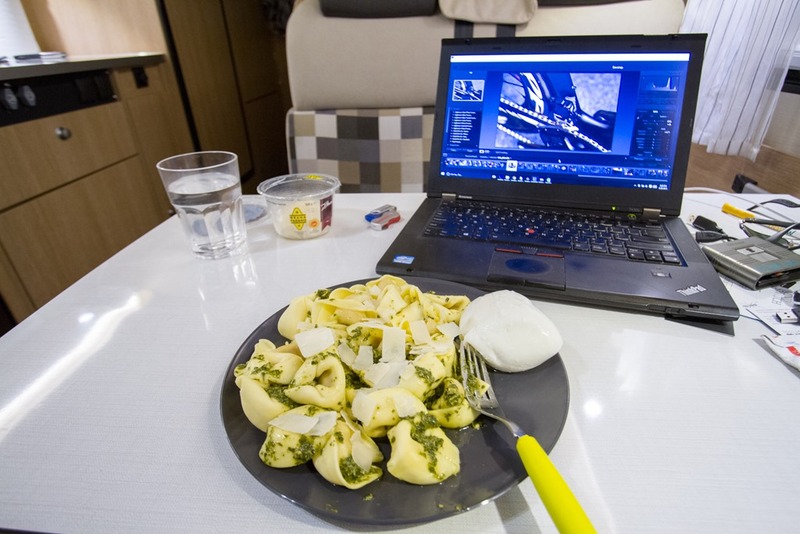 Im not planning on buying a RV! Yeah, shouldn’t the powerpod be mounted to the front of the rv so when you drive you can figure out how much power is used? Yup – these are awesome. 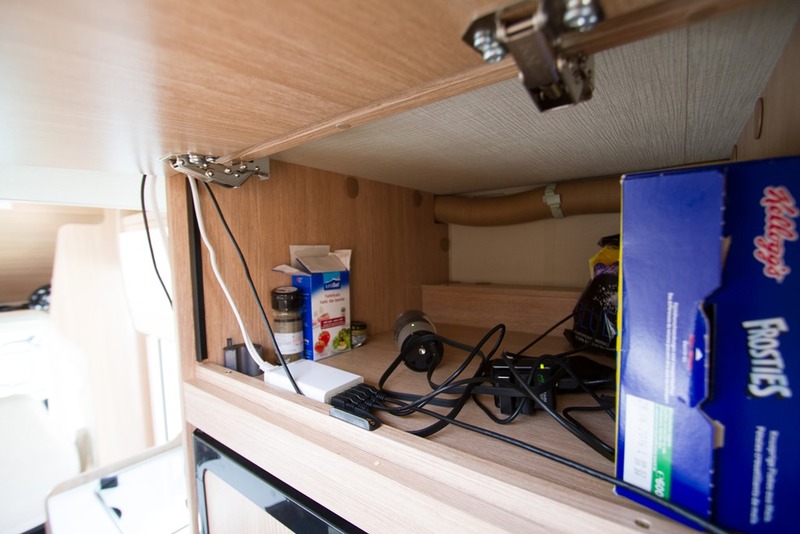 I’ve got the 12V car socket version too – fantastic, and very cheap! I didn’t know that you were in Zürich, otherwise i would’ve come to say hello to you. Love your posts! 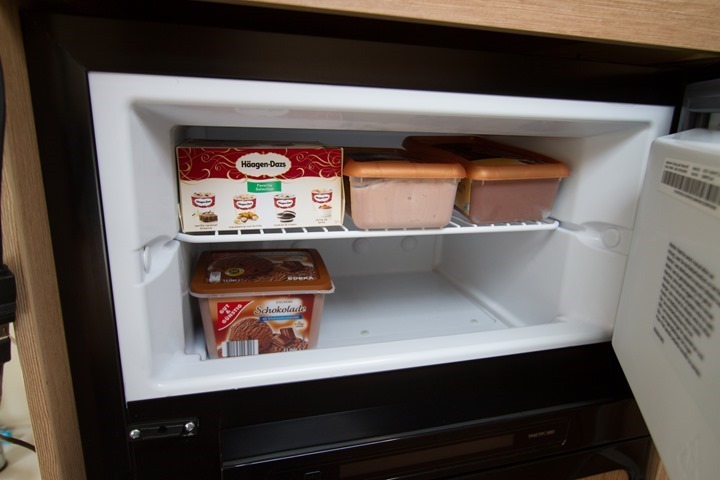 Now that’s how every freezer should look. 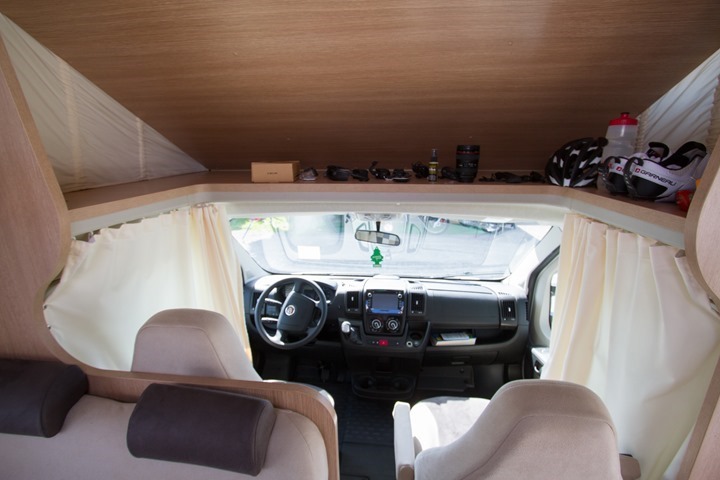 next time you rent a RV i would like to see you by us …. Nice rig! Thanks for sharing the details. We are heading to Germany next year for a race and I was thinking about renting an RV for a side trip to a TDF stage or two. This gives me some ideas. PS- The Girl is rubbing off on you, your pronunciation of “about” near the 2 min mark was very Canadian! PPS- Speaking of The Girl- why no cookies or cake in the cupboard? 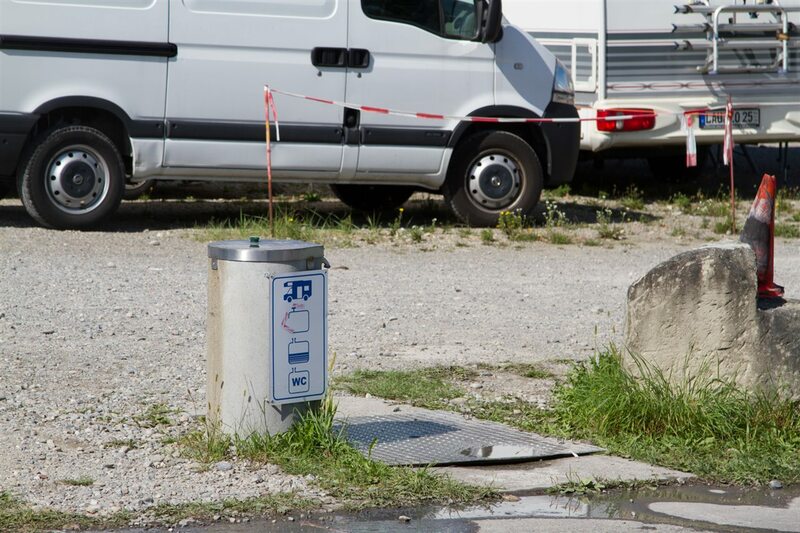 Sorry, but this is an incomplete tour… Where are the pictures at the dump-station, emptying the waste tank(s)? Didn’t have you down as a Frosties man. DCR: in the video, what d0 you have attached to your Garner left bike shoe? It’s a Garmin Tempe. I was doing some temp recording stuff with Epix and had stuck it there one day so I wouldn’t forget it on the bike I was using (wasn’t mine). Great little interesting video tour – thanks! 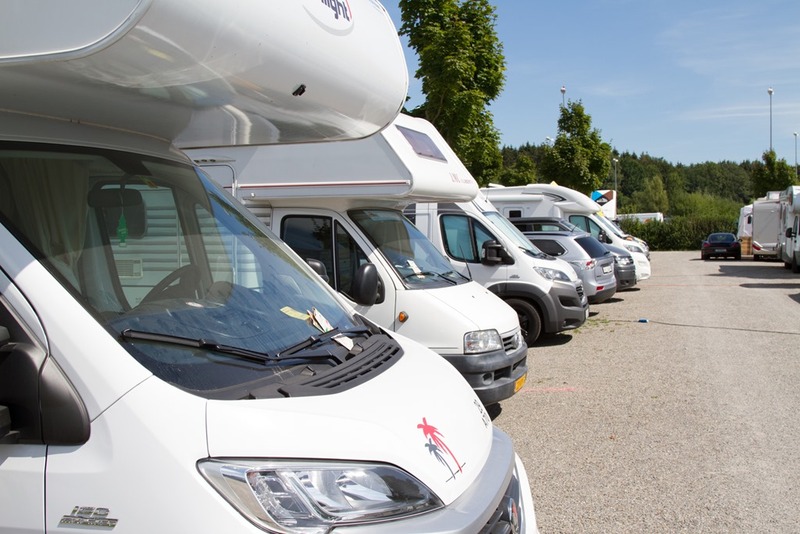 I was really hoping you had rented from Dirk Hofman Motorhomes. 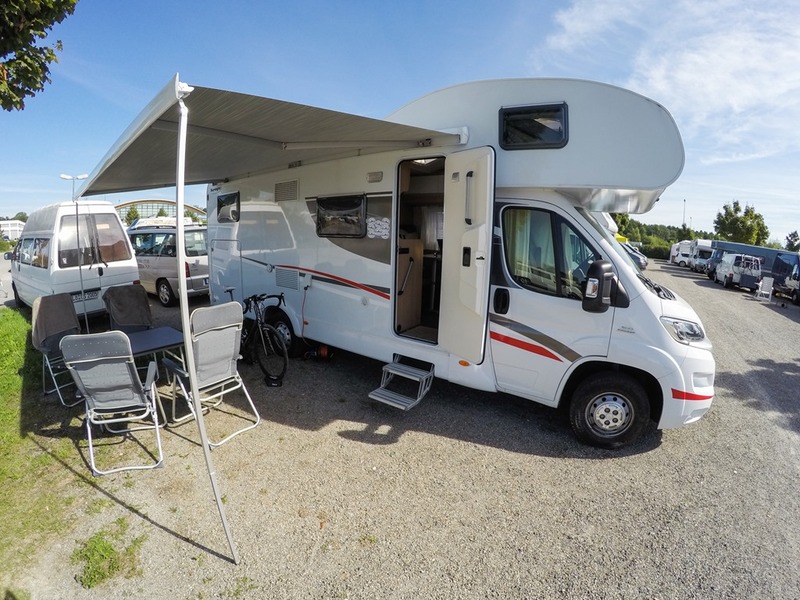 This was really interesting, I love RVs, thanks for sharing!